For first Human Nature Art show, Hoxton arches, London E2. 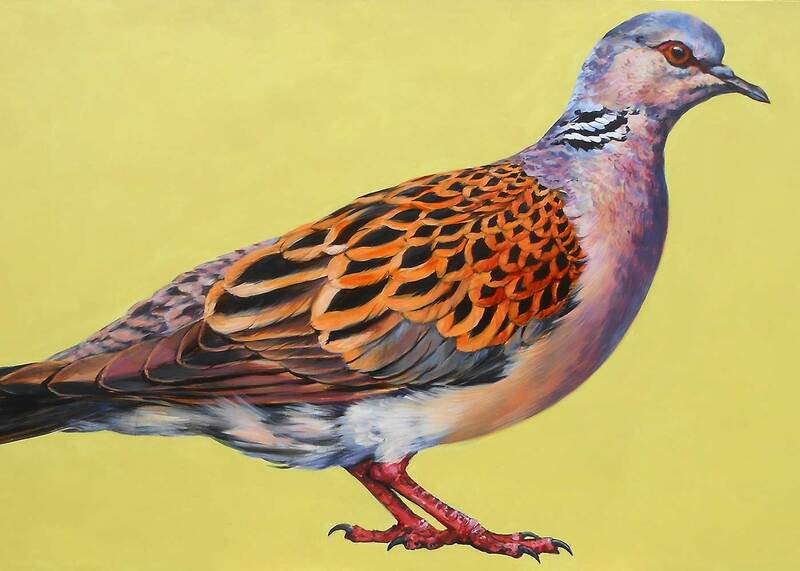 The turtle dove is one of our most endangered birds, declining at an alarming rate and heading for extinction in this country, with a 90% drop in numbers in the last twenty years. They are such a part of British history and literature, their beautiful gentle purring coos being an archetypal sign of summer in the dense overgrown ancient hedgerows they favour. But they now face multiple threats: the seeding weeds they depend on have all but disappeared with modern farming methods. We have lost 97% of our wildflowers since the end of the Second World War 70 years ago.They are also victims of spring hunting on Malta, when upwards of 5000 are shot each year as they stop off on this Mediterranean island en route to their nesting grounds from spending the winter in Africa. Agri-environment schemes in Britainhelp, with co-operation between farmers and bird protection organisations allowing the growth of farmland weeds and other seeding plants, but at present they are on a small scale. The EU classification of unused farmland fields as ‘abandoned’, and therefore ineligible for subsidies if they contain so much as a single thistle, is a serious disincentive for farmers to encourage wildlife.